St Vincent’s Hospital (3) — I do have a body after all! They are continually measuring my heart. Great technology. A monitor plugged into my chest which transmits from the Neuro ward on the 10th floor to the Cardio ward on the 7th floor, where someone watches my vital signs. Every once in a while, a nurse on the 10th floor will come say “Is something going on? Your vital signs changed. The 7th floor wonders what happened.” Once a lead came off. Another time, I had gone to the bathroom. I wonder what the response time is, when the two floors try to sort out what’s happening? All I know is they are recording my vital signs and my Cardio doc will examine these before they operate. They take my blood pressure continually here on the 10th floor. One nurse has very cold hands in the middle of the night! I ask them what my BP is: 120 over 80 which is normal for most people but not me. I take BP meds so I have to help the nurses recognize when I shouldn’t take certain meds because it will send my BP down too far. My “intake and output” is also measured. Need to drink more fluids. Need to do solid “output” more frequently. These things take care of themselves automatically when you’re in everyday life (or do they?). Maybe I should listen to Hacy when she suggests I drink more water. When you go past a certain age, your body needs attention. Have to change my habits after I get out of the hospital. That will be a challenge! 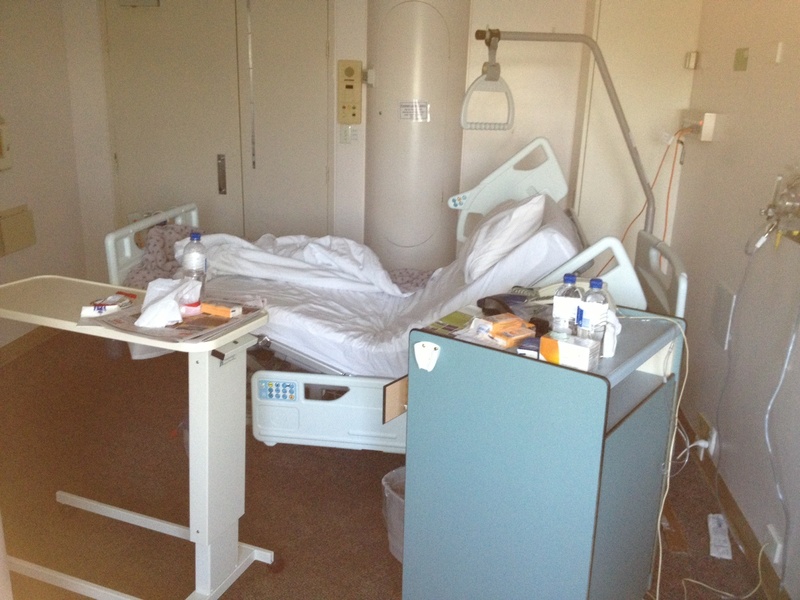 If you look at the hospital room in the picture, you’ll see a handle hanging above the bed. At home when I want to get out of bed, I roll over and swing my legs down in a fluid motion. After 3 days laying in a bed in the hospital, I’m too weak to do that. How quickly we lose our strength! Lesson: Our body needs to do exercize so we can roll out of bed, walk up and down stairs, etc. Another habit I have to change when I get out of the hospital! Many of you won’t understand how I think about life. When I say that I mainly live in my mind, disassociated from my body, you will think, “How does he do that? What about his 5 senses? Does he ignore them?” To imagine my way of living, think back to a time when you were really concentrating on something. Maybe you were listening to music and everything else disappeared. Maybe you were getting a massage and only felt the hands of the therapist on you skin. Maybe you were meditating and all your senses except your mind were absent — no sight, sound, taste, touch or smell. Only awareness of being still. That’s what it’s like for me much of the time. My mind is aware of my thoughts but barely aware of my surroundings. Imagine living with someone who has to consciously surface their “submarine” in order to connect with the people around them.